Dimensions 362'9" 35' by 11'4"
Radar periodically updated, including Type 290 and Type 291. 2x2, 2x1 20mm Oerlikons was standard by early 1944. 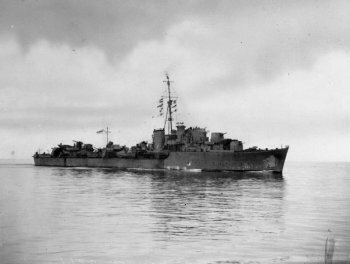 The Pakenham or "P" class of destroyers were completed in 1941-1942. They were very similar to the preceding "O" class, which saw no service in the Pacific. Both classes were described either as Quick Production Destroyers or Intermediate Destroyers, which were originally two different design programs that were merged when it was found that they had converged on similar designs. The Intermediate Destroyer was to be intermediate in characteristics between the Icarus class, which was a traditional small destroyer emphasizing torpedo armament, and the "J" class, with their larger size and relatively heavy gun armament. It was also to have enhanced antiaircraft capability. The Quick Production Destroyer was an emergency construction class prompted by the Munich crisis and clear imminence of war. To speed construction, the class was built on what was essentially a Javelin hull. Before most of the units were laid down, it became clear that antiaircraft capability was going to be important, and the original armament of 4.7" guns was replaced with 4" guns having greater antiaircraft capability. By the time the ships were deployed to the Pacific, they had had one 4" gun replaced with a second torpedo bank, except possibly on Paladin and Penn.